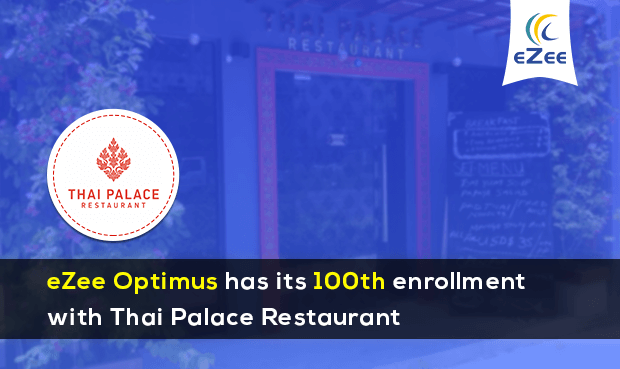 Surat, April 21: Our 100th client – Thai Palace Restaurant, is raking the benefits of the ‘live’ POS eZee Optimus. Cherishing 100+ global restaurateurs using eZee’s renowned cloud POS, we welcome a lot more restaurateurs who wish to adopt the POS and bloom their business. Streamlining food and beverage businesses worldwide the cloud-based POS eZee Optimus is another feather in the cap under eZee’s cloud software portfolio. Users can access the software from an internet-enabled device on any location. Keeping the data security aspect in mind, eZee Optimus is secured with HTTPS protocol. Most of the restaurateurs believe that advance technologies hold the key to addressing many of their current challenges. The cloud systems have become the hot trend in the space, as it allows all sizes of eateries to make use of advanced POS services. Thus, avoiding the mundane task of maintaining a back-end server at every location. Using the POS at the most critical times – in the business rush hour, be it a commuter coffee shop or the frantic luncheonette that has to get everyone in and out during a short lunch hour or an eatery serving a casual but fast dinner – the system performs in just the right way for every situation. The system offers POS mobility that enables switching between various order types, easy billing process, quicker services, analytics, and reports to strategize business results. Moreover, the system makes it easier for the restaurateurs who have a chain of restaurants to handle. Even the restaurateur can allow his employees to work in shifts and manage the F&B business easily. And, due to the powerful features it offers, eZee Optimus has gained importance among the restaurateurs for automating their day-to-day operations. By moving to eZee’s online POS system, restaurateurs can take full-fledged advantage of all the features, saving money by a centralized administration and still remain innovative when new features or trends emerge. And, now with the online restaurant POS system, eZee aims to expand their technical prowess in the industry with fresh innovations on the table.